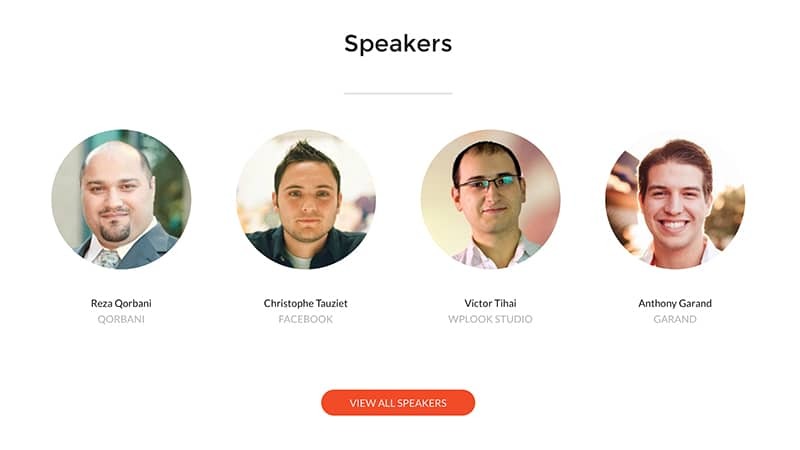 Conference is a Unique, Engaging and Fully Responsive Event WordPress Theme designed for Conferences, Seminars, Exhibitions, Meetups, Conventions and Congresses. This theme provides you with visual styling and professional looking design for creating a conference-based website to Organize a successful event, Promote your speakers, Add daily schedules, Sell conference tickets, Showcase your past and upcoming events and Expand your event to an entirely new and modern concept. Organizing an event can be fun and easy if you have the right theme. By using Conference WordPress theme, you open your doors to immense opportunities to make your conference shine online and build trust among your potential attendees. Conference theme is extremely flexible without being overly complicated. It offers you 11 Widget Areas, 8 Custom Post Types, and amazing features all tailored to meet your event organization goals. 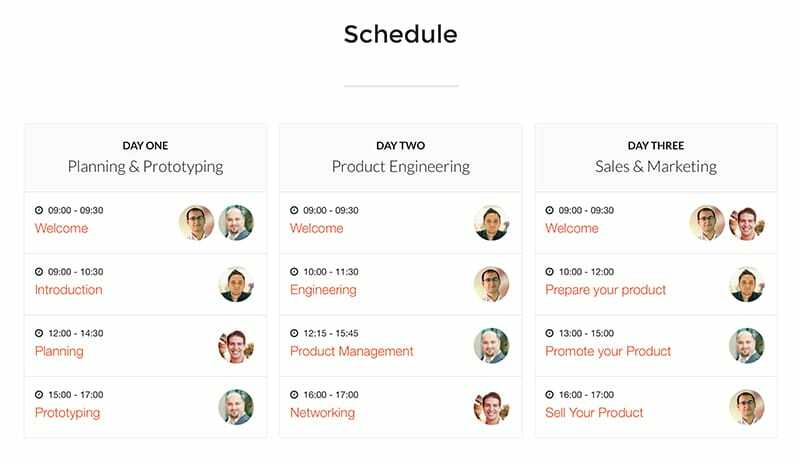 These features Include Speaker Profile Pages and Event Schedule. You will love the Online Ticket Purchasing Option that will allow your potential attendees to make reservations online. What’s more is that your visitors will enjoy top of the line site performance and crisp display of your content in whichever device or screen size they use to access your site. Your visitors will want to know the speakers you have invited to address them in your event. Conference gives you the ability to promote your speakers in a professional manner. You can create a small bio of each speaker in your site complete with a photo, the company they work for, short description and links to their social media profiles. Selling tickets online in your Event Website is now possible thanks to Conference. This Event WordPress Theme integrates PayPal and Eventbrite, allowing you to bring your events to fruition by selling tickets within a couple of clicks. Your visitors will love how easy and convenient it is to purchase tickets from your website, and they will be more than happy to attend your event. Conference allows you to manage and publicize your events online through the Schedule feature. You can showcase the schedule of the events to help your visitors do proper planning. By allowing them to plan for the sessions they hope to attend, this saves them precious time. Conference WordPress theme empowers you to provide your readers the opportunity to access the best events. The information you can relay using Schedule is Speakers, Daily Schedules, Hours and Subject of each event. You can publish all this information in an easy to read format. Conference’s blog template has a storytelling design that will add some glamor and fun to your website. Keep your visitors entertained with interesting news related to your work. An exciting blog will grab your visitors’ attention after they visit your site. By giving your potential attendees a chance to learn about the aspects of what makes your organization great, you gain their trust and credibility. 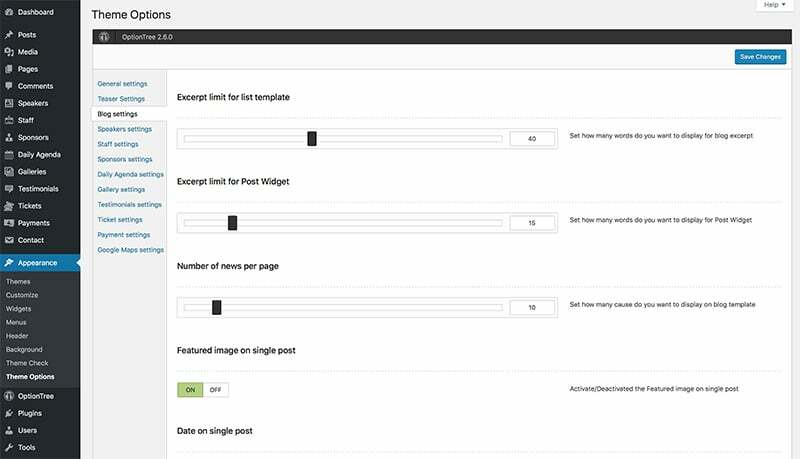 Conference WordPress theme puts you in charge of customization. You can create and edit every element anywhere on your site to your liking with utter ease, all thanks to the Advanced Theme Options in Conference. Pick from different Page Layouts that have awesome conference features (Blog, Speakers, Tickets, etc.) to craft a Conference website you will be proud of. This theme is well thought out and easy to use. It looks professional. All of my support questions (little tweaks we wanted) were answered promptly, thoroughly and pleasantly! I appreciate the prompt responses whenever I need help, or have a template change — thanks! Great Quality, I don’t know much about WordPress and i was still able to install and Victor answered my two questions instantly, and took a look at my website and told me what to corect, Great costumer service. I love the way i feel about my page and it was worth every penny. Great theme that needs more development to be perfect but we are almost there! Finally a conference theme that stands out!